Industrial patch cords shall be constructed of Category 5e, industrial grade, 24 AWG stranded, twisted 4-pair shielded SF/UTP cable with a flame retardant (CM) thermoplastic elastomer (TPE) jacket. 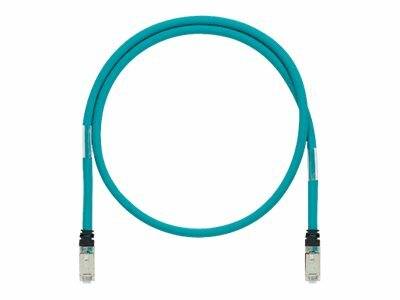 Patch cord cable shall be offered in multiple colors and lengths for design flexibility. Each patch cord shall be pre-terminated to include Category 5e RJ45 shielded modular plugs on each end, with a black strain relief boot, and wired according to the T568A standard. Each patch cord is designed to support high-flex applications and is rated for 600 V panel or on-machine applications when the space is shared with high voltage power cables.